Information for students K-6 about Hinduism as part of a series about major world religions. This spirit has different names and people pray to ask this spirit for help and love. The name of one religion is Hinduism, although its real name is Sanatana Dharma, which means ‘eternal truth’. People who follow this religion are Hindus. Their holy books are the Vedas. Veda means 'knowledge'. Hinduism (say hin-doo-ism) is the oldest continuous religion in the world and began in India in prehistoric times. It has the 3rd largest number of followers after Christianity and Islam. It is the main religion in India, Nepal, in Sri Lanka and India. While it may look like they have many gods, Hindus believe that there is one supreme god called Brahman. However they worship Brahman in many forms, such as Shiva, Rama, Vishnu, Ganesh, Lakshmi and others. Each form represents particular values or gifts and people pray to each to ask for those blessings. Most people have favourite forms they pray to most. The Hindu place of prayer is in a temple called a Mandir, or at home where a shrine has been set up. Hindus believe that life is a cycle of birth, death and rebirth governed by karma, or fate. Dharma is the following of religious and moral duties, living a good life. Karma is a belief that all your actions accumulate and have an effect on what happens to you. Put very simply, it can be said that what goes around comes around: do good things and good things will happen to you. Reincarnation: Hindus believe that a soul does not die but has more than one life, and what each is like depends on the previous one. Once a body dies, the soul is reborn and has another life in another body. A soul passes through a cycle of lives, and what that life is like is decided by karma : someone who is not good in this life will have an unpleasant time in their next life. All animals are considered by Hindus to be symbolic or sacred, as many were ridden by or companions of gods. Most Hindus are vegetarians: This means they don't eat meat, or fish, or anything that comes from animals. Milk is the only exception. However there are five particularly sacred animals. The cow is the holiest animal in India and it is forbidden to kill them. Cows are believed to be a gift from the gods. The monkey is the form taken by the god Hanuman, who represents power and strength. The largest monkey, Hanuman langur, is the most sacred monkey in India. The snake, in India the cobra, is sacred because Lord Shiva wears it like a necklace. There is even a festival of snakes. The elephant is sacred. It was ridden by Indra, and Ganesh has the head of an elephant . The elephant has been very important in India for centuries. The Bengal tiger was ridden by Maa Durga. It is one of the national symbols of India. Worship, called puja, takes place in a temple called a mandir. Mandirs range in size from small village temples to large buildings surrounded by walls. People can visit a Mandir at any time to pray and join in religious songs, or bhajans, as well as at times when ceremonies are being conducted by priests. Hindus also worship at home and often have a special room with a shrine to particular gods. Hinduism includes many religious festivals. 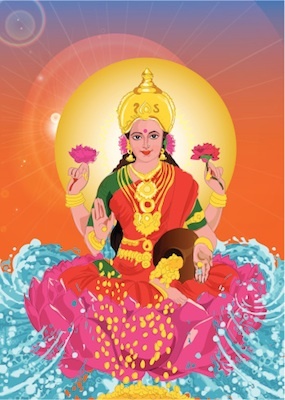 Read the kidcyber page about an important five day festival for Hindus known as diwali. Hindu weddings are important religious events, extending over a period of four to five days. They are highly traditional and follow ancient customs and traditions. It is not just the joining of two people, but of two families. There are three parts to a Hindu wedding. The first part involves long ceremonies in which gifts are exchanged between the two families. The second part is the wedding ceremony itself, in which the bride and groom make their vows. The most important part is when both walk clockwise four times around a sacred fire : three times the bridegroom leads and the fourth time the bride leads. After this the priest ties the ends of their scarves together to signify the marriage knot. In the last part of the ceremony the bride and groom take seven ceremonial steps together, each signifying an important part of marriage such as happiness, friendship, children. At the completion of these, they are married, and each puts a garland of flowers around the neck of the other. The third part includes meditation by the bride and groom, prayers for a good marriage, offering food to a god and receiving blessings. There are of course some variations in the ceremonies and prayers, according to the region or country. In India the bride's hands and arms and feet may be decorated in intricate designs hand painted in a paste made from the root of a henna plant, which last several days.